This was my best twistout to date and I have nooooo clue what products I used. I’m pretty sure it was a dry twistout though. Did I blog that day?! LMBO!!! I’m pretty sure that you did! So, go back and find the post so you can figure out which products you used!! That’s the beauty of blogging about our journeys!! Rece Your smile makes me smile lol!!! 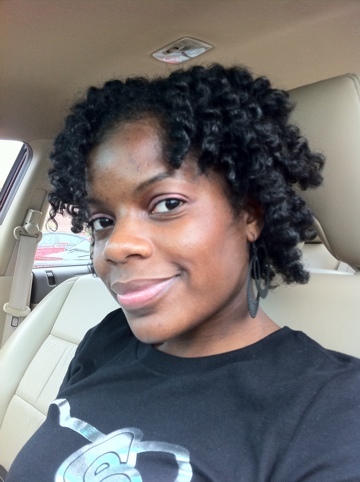 You always looks so happy in your pics…(not that you’re suppose to be frowning lol) I’m loving the twist out. I can only dream that mine will look like yours when I take them down this week! I definitely blogged about it and posted about it and FAILED to write what products I used. I don’t think I realized how good it looked at the time. Regardless of what products you used, your hair came out fabulous. I just wanted to remember how I did it so I can mimic this look. I guess a twistout will never look exactly the same anyway.